Marchers preparing to lay a wreath at the Danzinger Bridge. NEW ORLEANS (FinalCall.com) - Survivors and mourners not only marked the recent fifth anniversary of Hurricane Katrina but marched to remember the shooting of unarmed citizens seeking refuge on the Danziger Bridge six days after the horrific storm. The officers accused of the Sept. 4, 2005 crime and conspiring to cover up the deadly incident were heralded as the “Danziger Seven.” Eleven officers now face federal charges in the case and will have their next day in court on June 13, 2011. “To have 20 cops indicted is a very significant development in this city but we know historically that indicted cops eventually get released. They need to be tried in court immediately,” activist Malcolm Suber told The Final Call. In the Danziger Bridge case, some officers have pleaded guilty to conspiracy to obstruct justice. The charges against them range from falsifying evidence, perjuring witnesses and lying to the FBI. Mr. Suber is pushing for the trial to take place in New Orleans, which would increase chances for Blacks to sit on the jury. “If these officers get a change of venue then their case could possibly end up in a White conservative town that will sympathize with them and agree with their account of being under extreme stress—which led to these acts,” he said. “The Justice Department has a serious task of now convincing a jury that these officers were negligent and guilty of shooting these innocent people,” Rev. Raymond Brown told The Final Call. Rev. Brown heads the New Orleans Chapter of the National Action Network and co-organized the Sept. 4 march. “There have already been indictments and we will be pushing the Justice Department to pick a fair jury. We're going to form greater alliances and also keep responding to injustices in this city,” he said. “I think their behavior shows they need to be called the ‘Dangerous 7.' How can we not call them dangerous when you read about how they fired automatic weapons upon a family seeking refuge and then tried to cover it up by creating false witnesses and planting a gun?” said Student MinisterWillieMuhammad. Members of the group Community United for Change pressured the Justice Department to prosecute officers after the Danziger Bridge to seek justice in not that case and other violent incidents that occurred as floodwaters receded. “I think we have had a lot of input from the Department of Justice. I thank God for Attorney Eric Holder for what he has done,” Rev. Norwood Thompson told The Final Call. The Crescent City has been under a microscope since Mr. Holder was appointed by President Obama. The New Orleans FBI office recently announced it was actively investigating nine cases, seven of which happened right after Hurricane Katrina. Other Katrina-related cases under investigation include the alleged beating of two men on Religious Street; the nonfatal shooting of Keenon McCann; thealleged shooting of Henry Glover and subsequent burning of his body; and the shootings of Danny Brumfield and Matthew McDonald. Five officers have been charged in the Henry Glover case. The other cases are the July 2005 alleged beating death of Raymond Robair, a February 2008 brawl at the Beach Corner Bar and the January 2009shooting of Adolph Grimes. According to a report on NOLA.com, legal experts say several of the cases could be hampered by statutes of limitations. “The five-year time limit to bring charges in many federal crimes appears to apply to at least two of the incidents that have been under the federal microscope: the alleged beating by New Orleans police officers of two men on Religious Street on Sept. 1, 2005, and the nonfatal shooting by police of Keenon McCann on that same day,” the report said. Activists, various religious leaders, politicians and others commemorated the Danziger Bridge shootings by having a wreath laying ceremony in memory of the victims. Participants marched, chanted and prayed before laying several wreaths at the spots on the bridge where James Brissette and Ronald Madison were shot by members of the New Orleans Police Department. “When I first went to the hospital and saw the mother who lost an arm. I asked her ‘who did this to you all?' She said ‘pastor it was the police'. I thought she was crazy or just being delusional,” said Reverend Leonard Lucas, whose church is attended by the family of one of the victims. In addition to making a demand for justice, Minister Muhammad said citizens of New Orleans are owed an apology from the police department. “Members of the police department gathered in the hundreds. Cheering and declaring the innocence of these officers when they turned themselves in after being charged,” Mr. Muhammad observed. After the march across the bridge organizers and participants gathered for a brief press conference and talked about next steps. “We need even more Black unity in the city of New Orleans right now. Maintaining a long protracted protest can be challenging. We all have to get involved,” said Mr. Suber. “We plan to build a stronger network between the religious institutions and keep uniting with various organizations to address the issues of our community. 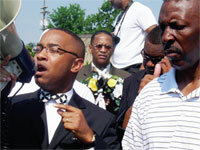 The work is not over until justice is served,” said Rev. Brown. Since its inception in March, Community United for Change group hosted and documented five public community hearings where citizens gave testimonies about their unjust experiences with the New Orleans Police Dept. (NOPD). Stories varying from police shootings to brutality were delivered in DVD format to the local offices of the U.S. Dept. of Justice, they said. “Until the federal government puts something in place, we will continue to see these types of acts by NOPD. We're still in a position to see these cops get off free despite the indictments. So we're going to keep pushing, “ activist Wes Johnson told The Final Call.